Azerbaijanis living in the United States are among those who are impatiently waiting for the final of Eurovision-2012. Today they gathered in Washington, Boston, Houston and other cities as part of “Support Eurovision” campaign to watch the great final live. The events are being organized jointly with the Karabakh Foundation of the US. Representatives of the Azerbaijani community in New York gathered on May 24 to watch the second semifinal of Eurovision-2012. 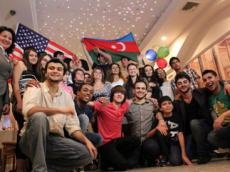 The participants of the event were holding he flags of the US and Azerbaijan and shared their joy with American, Turkish, Uzbek, Georgian, Peruvian and Columbian youth.